Readers of my blog have undoubtedly noted my predilection for original sources. Whenever possible I intend to supply the exact title and location of sources or to give indications about critical editions. Instead of pointing to reliable translations I prefer giving information about a text in its original version. Thus my post in 2011 about modern translations of the Corpus Iuris Civilis was in a way exceptional. Digital libraries can give you online access to both original sources and text editions. However, there is another form in which you may encounter a particular text. For a substantial number of remarkable manuscripts, books and archival records facsimile editions have been published. When you visit a department of manuscripts and old books at a national or university library you have often a marvellous collection of printed facsimile editions at hand. Many years ago I spent an afternoon with a facsimile edition in black and white (!) of the Utrecht Psalter (Utrecht, University Library, ms. 32). 1 By the way, this library prepares a new online version of this famous manuscript which will be launched this autumn. Students, scholars and teachers all have reasons to use facsimile editions, be it for research or for educational purposes. What resources can one use to find facsimile editions quickly? What is the quality of some online inventories? What help do they offer when you look for a text or resource in connection with legal history? In this post I try to provide some answers to these questions. Due to the very scope of a blog post the result can only be a guide in a nutshell, but nevertheless it might help anyone looking for a very particular and valuable resource. The title of this post reflects not only the history of book titles such as the Speculum iudiciale by Guillelmus Duranti (around 1230-1296), but also for example the Digital Mirror of the National Library of Wales, the entrance to its digital collections. In a postscript I briefly look at other search strategies and online resources. The combination of printed guides and bibliographies, online catalogues and meta-catalogues with the special databases discussed here gives the best chances to find both facsimiles and reliable information about them. The exceptional value of a manuscript or book is determined by several factors. The age of the manuscript or book. the state of its preservation, its unique role as a text carrier, especially when it is a rare or even the only textual witness, and often also the illumination or illustrations play a role in selecting as the object of a facsimile edition. Some manuscripts are considered very special indeed. Simple mortals are not allowed to see them, and even scholars must have very good reasons to convince a holding institution of the urgent need to consult the original. The Codex Florentinus of the Digest held at Florence is a good example of this class of manuscripts. Sometimes legal historians have in front of them a list of earlier visitors who consulted a manuscript, and it takes considerable courage to add your name after Theodor Mommsen and other giants. Last year I wrote about legal history in the Austrian city Graz. One of the websites maintained at the university library of Graz is an online bibliography of manuscripts in facsimile editions. In 1976 Hans Zotter published the first edition of the Bibliographie faksimilierter Handschriften (Graz 1976) with 637 titles, and in 1995 Hans and Heidi Zotter came with a second edition for titles published until 1992, this time on disc. To the search interface of the current website are added a list of relevant literature, an overview of series by major publishers and a list of abbreviations. You can search this online database either using the location of holding institutions and with any search term (Volltextsuche). As an example I use a famous German legal text, the Sachsenspiegel, “The Mirror of Saxony” by Eike von Repgow. At four German libraries so-called codices picturati are held, wonderfully illustrated manuscripts which long have been revered as the primary example of sources for legal iconography. The database in Graz provides you systematically with basic information about a manuscript and bibliographical information about the facsimile edition. For the Codex Florentinus a search for “Firenze” yields not only the two facsimile editions (1900 and 1988), which happen to come into view at the top, but also all other facsimile editions of manuscripts kept in Florence. With Ungenannter Ort, “location not indicated”, you get those editions of manuscripts where the location of the – often private – library is not indicated. The free text search brings you also to the register of editors. It would be a miracle if the database at Graz was flawless, but it took me some time to find an example of a missing edition. The University of Arizona in Tucson has a created an online exhibit of Mixtec, Mayan and Aztec codices, with an extended list of relevant facsimile editions. With a few exceptions I found every edition mentioned in this exhibit in the Austrian database. These manuscripts give me a chance to mention the beautiful online exhibit at the Tarlton Law Library of the University of Texas at Austin on Aztec and Maya Law: An Online Exhibit and Bibliography, based on an exhibition created by Mike Widener and his colleagues at this library in 1992. The web version has been revised and updated in 2010. At this point it is only sensible to ask for a royal road to facsimile editions. Can you tune one of the major online meta-catalogues to search specifically for these kind of editions? I tried the advanced search interface of WorldCat, but even though the dropdown list of materials to be specified is most impressive facsimile editions are conspicuously absent. At the Karlsruher Virtueller Katalog (KVK) one can use the search term “facsimile” in the free search field and add additional search terms in any field, which however works only for a restricted number of catalogues connected to the KVK. As a matter of fact you will find bibliographies which mention facsimile editions or even contain a specific facsimile, but apart from Zotter’s book and disc I did not yet find a modern bibliography of facsimile editions of manuscripts. For some subjects specialized bibliographies of facsimiles exist, for example botany and cartography. It did cross my mind to search at Archivalia, the blog maintained by Klaus Graf which functions as a treasure trove for all matters concerning libraries and archives, but apart from one of the sites discussed here below I mainly found links to specific projects and websites. Let two examples mentioned at Archivalia suffice: sometimes I wonder why libraries use the term facsimile for digital versions, as for example for this nifty preset search action for digitized manuscripts at Leiden University Library, The second example is rather special, a list at Manuscripta Mediaevalia of digitized versions (!) of facsimile editions on microfiche of medieval manuscripts with mainly German texts in the series Codices Illuminati Medii Aevi (CIMA). For testing the two remaining websites to be discussed here I will use as search examples apart from the Sachsenspiegel and the CIMA series also the Codice Florentino manuscript of Bernardino de Sahagún (Florence, Biblioteca Medicea-Laurenziana, ms. Palat. 218-220), a veritable encyclopedia of the Aztec civilization.2 In fact the first site for finding facsimiles which prompted me into writing this post is called Facsimile Finder. Its subtitle “The complete database of illuminated manuscripts” at once invites you to check its quality. At the same time a restriction to illuminated manuscripts is clearly stated at the outset. The Facsimile Finder, a website run by two Italian scholars who also are the owners of the publishing house Codices illustres, easily presents the four illuminated manuscripts of the Sachsenspiegel, and shows them with an image of the manuscript and the facsimile edition. The site gives for each manuscript the main elements of a codicological description, and also information about the background of the text and illuminations. On the page for the Oldenburger manuscript (Oldenburg, Landesbibliothek, Hs. CIM I 410) it reads rather curiously that the manuscript is held at the Niedersächsische Staatsbibliothek in Hannover. When I looked for the exact title at Facsimile Finder of the facsimile edition by the Austrian publisher Adeva the title turned out be left out at both websites. Adeva states as the holding institution the Niedersächsische Sparkassenstiftung in Hannover. However, this institution certainly bought the manuscript in 1991, but placed it immediately as an extended loan at the Landesbibliothek in Oldenburg. A classic bibliographical search for the exact title yielded as a result that Ruth Schmidt-Wiegand edited the commentary to the edition “im Auftrag der Niedersächsischen Sparkassenstiftung Hannover”, by order of the Lower Saxon Savings Bank Foundation.3 Obviously it is possible not only to miss the clear indication of the location of a manuscript, but also to mix up a foundation and a library. Do you need any comments about the presentation both at this search site and by the very publisher of the facsimile? For the three other codices picturati of the Sachsenspiegel the indication of the holding library and the manuscript’s signature is correct, but here, too, as for all entries at Facsimile Finder, no title is given among further details such as the publisher, the editor, year of publication and current price of a facsimile edition. To put the record straight, on its own website Adeva equally leaves out the exact titles of their editions. – the Leyes de Burgos (1512) from the Archivo General de Simancas, Registro General del Sello XII-1512. I was genuinely surprised by the facsimiles of the charter with the oath of the Spanish king Philipp II on his investiture for Sicily in 1555 (Città del Vaticano, Archivio Segreto Vaticano, A.A., Arm. I-XVIII, 522), the credential given by George Washington to William Short as ambassador in Spain (1794) (Madrid, Archivo Naciónal de España, 1794, junio 5 Filadelfia Estado Leg. 3890-14) – with unaccountably attached an image of the 1555 oath by king Philipp II – and the Furs (Valencia, Arxiu Municipal), royal legislation from 1461. The Arxiu Municipal of Valencia is also mentioned for its manuscript from 1407 of the Libro del Consolato del Mar. A quick search for this legal text learns me that apart from the facsimile published in 1977 facsimiles appeared in 1947, 1979, 2004 and 2006, none of them mentioned here. To conclude for the sake of completeness, the CIMA series is not mentioned at all, nor the manuscript of Bernardino de Sahagún. Now you might quarrel with me that I cannot hide my irony about the website just discussed, but it is ironical that the second website I want to discuss is also called Facsimile Finder. At a German website called Faksimile Finder the subtitle is “Facsimile Finder – Bibliotheca Alexandriae”. This website in English lets you choose search fields from a dropdown list, the preferred language, and you can narrow your search by indicating the period between particular years. The database contains more than 2600 entries. Browsing lists of locations and subject groups is another possibility; “Jura”, German for “laws” , is one of the subject groups. You can choose several ways, too, to sort the results. This website brings you to online versions of manuscripts, not to facsimile editions in printed form. At the bottom of the search interface you can follow the links to a number of websites concerning medieval manuscripts, early printed books and sources for Classical Antiquity, Japanese and Chinese Buddhist studies. Let’s quickly go through the results of my queries: for the Sachsenspiegel only the online versions at Heidelberg and Wolfenbüttel appear, the Codice Florentino on Aztec history is not included nor manuscripts from the CIMA series. For those curious about the exact signatures of the illuminated Sachsenspiegel manuscripts I have put them in a footnote together with links to the digitized versions.4 The subject group “Jura” contains just one item, the Wolfenbüttler manuscript of the Sachsenspiegel. The omission of the other Sachsenspiegel manuscript is strange. To all appearances it seems the creator of this database certainly put a lot of work in creating a subject index, but the actual results are for this particular subject distinctly meagre. Should we end lamenting the sad state of affairs of these three databases concerning facsimilised or digitized manuscripts? What did we see in the mirror? The database at Graz is wonderful, its bibliographical accuracy is high, but an update is most welcome. The Italian Facsimile Finder looks splendid, but its range is restricted to illuminated manuscripts and the actual number of editions, too, could be larger. The omission of titles and some factual mistakes do not work in favour of this website. When I asked information about this website Giovanni Scorcioni kindly informed me he is working on a new enhanced version with more facsimiles. A sneak preview is indeed promising. The problem with the exact titles is mainly caused by relying on the data and images given by publishers, and the information about the Oldenburger Sachsenspiegel will be corrected. The German Faksimile Finder covers a wide range of subjects, contains a substantial number of manuscripts and books, but focuses effectively on online versions of manuscripts and rare books. Its subtitle points to the ideal of the classic library at Alexandria which aimed at being a bibliotheca bibliothecarum. Its modern successor,, the Bibliotheca Alexandrina hosts a mirror site of the Internet Archive. Other major universal digital initiatives have mirror sites, too, especially the Universal Digital Library of the Carnegie-Mellon-University Pittsburgh, with in this case even three mirror sites, two in China and one in India. Yet another possible gateway to medieval manuscripts in facsimile came into view for this contribution. I did notice references to Charles D. Wright (University of Illinois at Urbana-Champaign) and his online bibliography Medieval Manuscripts in Facsimile and Microform, for example in the very useful guide to medieval manuscript catalogues, microforms and microfilms of UPenn Libraries, but alas the link does not function. The guide to medieval manuscripts at UIUC gives a different URL for Wright’s bibliography, but this, too, is currently not working. Only after a long search I found a reference at Umiltà to a third version from 2008 and last published in 2010 which does not exist any more, too, but luckily was archived at the Internet Archive. It turns out to be a list with examples of facsimiles of illustrated medieval manuscripts organized by subject in alphabetical order, with for “law books” just two entries. This list simply does not fit in a comparison of databases. The page for facsimiles at Umiltà is just a list of some publishing houses and their websites with a few images attached. At least one library has its own special database for finding microfilms and facsimiles of medieval manuscripts. The Medieval Institute Library at the Hesburgh Libraries of the University of Notre Dame, Ind., shows in its database information about some 9,000 microfilms and 600 facsimile editions in its holdings. Apart from a nice array of search filters you will find also information about online versions of particular manuscripts. I could not help sighing for sheer relief when seeing and testing this great resource, and even more when you can easily track at least fourteen legal texts. In my view it is a model to follow for a project which would cover editions for other periods and subjects. In my opinion it is not by chance that you can find at the Hesburgh Libraries also an excellent online exhibition on the medieval inquisition, and an online catalogue of some 200 facsimiles of medieval seals. Combining the database of the Hesburgh Libraries with for example its smaller counterpart at Fordham University is one of the search options that scholars can follow. It is easy nowadays to find the major online projects concerning medieval manuscripts for particular regions, languages and subjects, and anyway this post has at this point already grown too long to include any of them. If you insist you might have a look at my own page on medieval manuscripts. If we had been looking for facsimiles of medieval charters, things would be very different. At the French portal for medieval studies Ménestrel you could go for example to the very detailed list of editions created at the École Nationale des Chartes in Paris. It scarcely needs a reminder that for digitized medieval manuscripts, too, we do not have – and most probably will not have for some time – a portal that really covers the growing number of manuscripts accessible online. Using websites as the Catalogue of Digitized Medieval Manuscripts at UCLA, other sites as listed for example at Ménestrel, the great links page for legal manuscripts made by Gero Dolezalek, to which I can only add the digital manuscript index DMS at Stanford, still in its infancy but promising, the portal Manuscripts Online: Written Culture 1000 to 1500, and Europeana Regia, a project which I discussed here in 2011 and 2012. The website at UCLA was created by two courageous scholars, but in 2013 they decided to stop the project which did present three thousand manuscripts. For Old English manuscripts John Herrington created already in 1998 a website with a downloadable Excelsheet which perfectly serves as a guide to facsimiles. I am sure some of the more specialized databases for medieval manuscripts do contain information about the presence of facsimile editions. Adding when possible information about such editions to the Manuscripta Juridica database at Frankfurt am Main, the online version of the 1972 repertory of manuscripts with Roman law texts created by Gero Dolezalek and Hans van de Wouw, is certainly desirable. Creating and maintaining a database for finding facsimile editions that would fulfill the most exacting scholarly demands would be quite a feat. The major demand here is the creation of a full bibliographical record for a facsimile, which has to contain both data on the edition in itself and on the object published in facsimile. Meanwhile hopefully the combination of resources I discussed here can help you to find what you need, or at least inform what you can expect from these resources. In my view it is only by cooperation, team work and a clear long-term view that such large and ambitious projects can succeed. As for how and when this will happen, these biblical words seem most apt, “for now we see in a mirror, dimly” (1 Corinthians 13,12). 1. Ernest T. DeWald (ed. ), The illustrations of the Utrecht Psalter (Princeton, NJ-London-Leipzig, 1932). 2. The facsimile edition is [Historia general de las cosas de Nueva España] : manuscrito 218 – 20 de la Colección Palatina de la Biblioteca Medicea Laurenziana ; codice florentino para mayor conocimiento de la historia del pueblo de Mexico (3 vol., Florence-México 1979). 3. Der Oldenburger Sachsenspiegel: vollständige Faksimile-Ausgabe im Originalformat des Codex picturatus Oldenburgensis CIM I 410 der Landesbibliothek Oldenburg / Textband [und Kommentarband] herausgegeben von Ruth Schmidt-Wiegand im Auftrag der Niedersächsischen Sparkassenstiftung Hannover (2 vol., Graz 1995-1996). The format of the edition Graz-Darmstadt 2006) is slightly reduced and it does not constitute a normal facsimile. 4. Dresden, Sächsische Landes- und Universitätbibliothek, ms. 32, digital version; Heidelberg, Universitätsbibliothek, Cod. Pal. Germ. 164, digital version; Oldenburg, Landesbibliothek, CIM I 410, digital version; Wolfenbüttel, Herzog-August-Bibliothek, Cod. Guelf. 3.1 fol., digital version. 5. Leonard Boyle, Medieval Latin Palaeography: a bibliographical introduction (third edition, Toronto 1995). The updated Italian version: Paleografia latina medievale (Rome 1999). My discussion focused on a number of specialized databases. In passing I referred to using the bibliographical information in library catalogues and meta-catalogues. I was kindly alerted to look again at the possibilities of WorldCat to retrieve facsimile editions. On closer inspection I do admit that I dismissed WorldCat too quickly, but you do face the fact of depending very much on the quality of the bibliographical records harvested by WorldCat, or at any other meta-catalogue. In particular a search at WorldCat for medieval law texts in facsimile with among the results a facsimile edition of the Westphalian Peace (1648) fueled my mistrust. Years ago I created my own list of major libraries and their online catalogues. It is perfectly sensible to use them, too, for finding facsimile editions. Combining the information in printed bibliographies, some specialized databases and a number of (meta-)catalogues at major libraries is the way to find facsimile editions. Some printed bibliographies are accessible online. I want to single out the vast work edited for the Library of Congress by Guadalupe Jiménez Codinach, The Hispanic world, 1492-1898 : a guide to photoreproduced manuscripts from Spain in the collections of the United States, Guam, and Puerto Rico / El mundo hispánico, 1492-1898 : guía de copias fotográficas de manuscritos españoles existentes en los Estados Unidos de América, Guam y Puerto Rico (Washington, D.C., 1994), which serves not only as a directory to American collections, but informs you also about a multitude of works which have appeared in facsimile editions. The guide can be consulted online at Purdue University. I tracked this guide using the Hathi Trust Digital Library. Only a very small number of books presenting facsimiles of legal works can be consulted in full view through the services of this major enterprise. Mentioning the Library of Congress should ring a bell for the LC Subject Headings. Using them for your searches in relevant catalogues does indeed help to narrow your results. However, the problem remains of bibliographical records with either lacking subject information or at the other end almost too much details, in particular chains of LC Subject Headings which can be in my opinion far too specific. As for finding books related to law, some universities and institutions have the luxury of both general and specific law library catalogues, for example Yale University with both the general Orbis catalogue and the Morris catalogue for Yale Law School. For the Utrecht Psalter (Utrecht, UB, ms. 32) there is a new digital presence with accompanying information, you can also go straight for the digitized manuscript itself in the Special Collections of Utrecht University Library. This entry was posted in Manuscripts and tagged Bibliography, Digital libraries, Early printed books, Legal history, Legal iconography on September 16, 2013 by rechtsgeschiedenis. This month the walking historian marches again! In July I visited the tiny town of Oudewater, a city in the southwest corner of the province Utrecht. In the beautiful old city of Oudewater the historic Heksenwaag, the Witches Weigh-House is not to be missed. However, in fact I did almost overlook it due to the fact that in my memory the building was much larger. As a kid I had visited the Heksenwaag, and I even received the certificate stating my weight was normal. Coming back to this town things seemed different, but the degree of change was really surprisingly low. Afterwards I could not help questioning what I had seen and doubting my assumptions and conclusions. Moreover, the Heksenwaag is not just a building which any tourist has to visit, but it is a veritable Dutch lieu de mémoire. It links directly to the history of European witchcraft and the ways law and justice dealt with this phenomenon. The results are interesting enough to include in this post which has as its second focus the perception of Oudewater’s history. In De canon van Nederland, “The canon of Dutch history”, the Heksenwaag at Oudewater is connected to emperor Charles V. He is said to have granted Oudewater in 1545 a privilege to weigh persons suspected of witchcraft and to issue certificates of normal weight. The vogue for historic canons in the Netherland has led to several regional canons. In the canon for the southwest corner of Utrecht the story of the Heksenwaag is strongly qualified. Legend had preserved a tale of Charles V doubting in 1545 a witch trial at Polsbroek where a woman had been weighed and found too light. He ordered a second weighing at Oudewater, showing her to have a weight of 100 pounds, which saved her, As a sign of gratitude for the correctness of the staff at the weigh-house he granted the privilege. However, there was no weigh-house at all in the village of Polsbroek. The scene of the false weighing could have been the town of IJsselstein. There is no trace of any privilege from 1545 for Oudewater. The remarkable insistence on some presumed historical facts in the history of Oudewater comes in a different perspective when looking at a number of events that most certainly determined its history. During a war between the bishop of Utrecht and the count of Holland Oudewater was severely damaged during a siege in 1349 (see for example the Divisiekroniek of Cornelius Aurelius (Leiden 1517) fol. 212 recto). 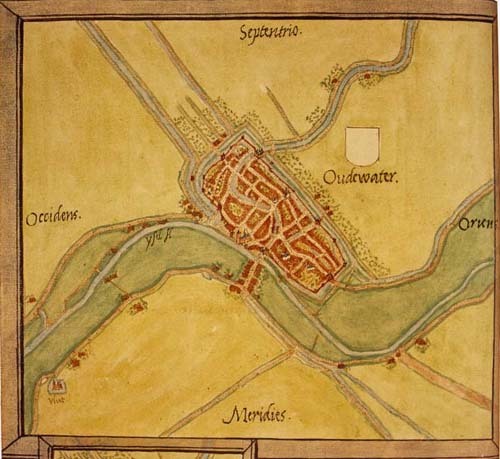 Oudewater held a strategic position a the junction of the rivers Linschoten and Hollandse IJssel. In 1281 the bishop of Utrecht pledged Oudewater and some other possessions for 6000 livres tournois to the counts of Holland (OHZ IV, 1938 (1281 January 24)). The bishops of Utrecht never were able to repay this sum, and thus Oudewater remained until 1970 a town in Holland. On June 19, 1572, Oudewater was captured by Adriaen van Zwieten, and it became one of the earliest cities in Holland to side with William of Orange. On July 19, 1572 Oudewater participated with sixteen other cities in the first independent session of the States of Holland at Dordrecht, a landmark in the long struggle of the Low Countries with Spain, the Eighty Years War that lasted until the Westphalian Peace (1648). The change of sides in June 1572 and the presence of Oudewater at the historic session in Dordrecht a month later had undoubtedly been noted by the Spanish authorities in the Low Countries. The locations of Dutch cities had been chartered quite recently by Jacob van Deventer, the cartographer charged by the Spanish king Philipp II with a large-scale cartographical project. The surviving maps have been digitized in the Biblioteca Digital Hispánica. When Spanish forces approached Oudewater in August 1575, an ultimatum was sent urging the city council to surrender. By sheer misfortune this ultimatum was not properly understood. 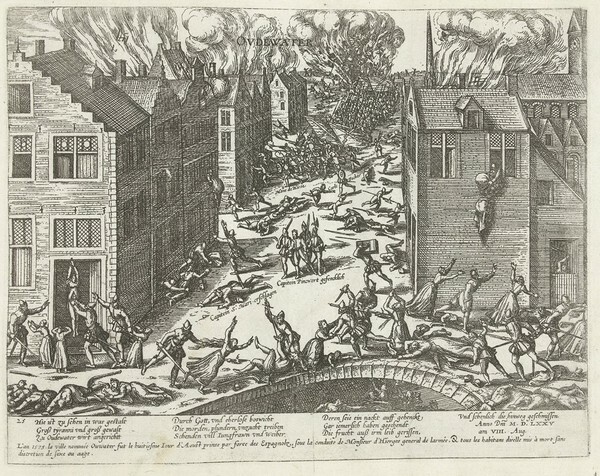 On August 7, 1575 the city was set to fire and many citizens were ruthlessly murdered. Only the church of St. Michael’s and a monastery did escape the devastations. These events clearly affected also the survival of historical records. With much support from nearby cities such as Gouda Oudewater was quickly rebuilt. The results of this building campaign are still visible in the center of the city which looks indeed rather unified if you look closely enough. The destruction of the original buildings, and presumably also of many historic records, explains the tendency to stick to some acclaimed stories and events. Archival records concerning Oudewater can in particular be found at the Regionaal Historisch Centrum Rijnstreek in Woerden and at Het Utrechts Archief in Utrecht. The survival of written records plays a role, too, in the project of Sophie Oosterwijk and Charlotte Dikken on the floor slabs of St. Michael’s at Oudewater. Perhaps I had start here better with stating my relative unfamiliarity with the history of witchcraft. As a historian I have kept this subject on purpose on a safe distance, but in the end there is no escape from it, in particular because the subject of persecution and trials is not far away from the main territories of legal historians. Debunking some part of history is nothing special, nor is it my aim to expose any mystification. Others have done this thoroughly for the Witches Weigh-House. Under the pseudonym Casimir K. Visser the exiled German journalist and historian Kurt Baschwitz (1886-1968) published the study Van de heksenwaag te Oudewater en andere te weinig bekende zaken (Lochem, ; online at the Dutch Royal Library). 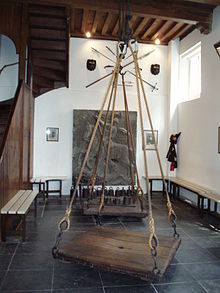 Baschwitz pointed to an inspection in 1547 of the weights used at the weigh-house, a fact adduced by earlier historians, but actually a normal procedure which says nothing about any special use. He notes the careful avoidance in the certificates of any reference to a belief in witches, witchcraft, sorcery and similar things. Baschwitz referred to Johannes Wier (around 1515-1588), the famous Dutch physician who fought against superstitions, Wier did not mention Oudewater at all in his 1563 treatise De praestigiis daemonum nor in his De lamiis (1577). Both books were often reprinted and appeared in translations. Balthasar Bekker (1634-1698), too, did not credit Oudewater with any special role in his famous book De betoverde weereld (1691). Baschwitz published in 1963 his great study Hexen und Hexenprozesse. Die Geschichte eines Massenwahns und seiner Bekämpfung (Munich 1963). Hans de Waardt reviewed the historiography concerning Oudewater and witches in his article ‘Oudewater. Ein Hexenwaage wird gewogen – oder: Die Zerstörung einer historischen Mythe’, Westfälische Zeitschrift 144 (1994) 249-263 (online (PDF) at the Internet Portal Westfälische Geschichte). De Waardt wrote his Ph.D. thesis on sorcery and society in the province of Holland, Toverij en samenleving in Holland, 1500-1800 (diss. Rotterdam; The Hague 1991). For the study of Johannes Wier Dutch readers can benefit from the marvellous recent study by Vera Hoorens, Een ketterse arts voor de heksen : Jan Wier (1515-1588) [A heretic physician for the witches, Jan Wier (1515-1588)] (Amsterdam 2011). On Balthasar Bekker Johanna Maria Nooijen published in 2009 “Unserm grossen Bekker ein Denkmal”? : Balthasar Bekkers ‘Betoverde Weereld’ in den deutschen Landen zwischen Orthodoxie und Aufklärung (Münster 2009). It might be useful to mention the special website of the main Dutch historical journal Bijdragen en Mededelingen betreffende de Geschiedenis der Nederlanden / Low Countries Historical Review where you can search online in the issues from 1970 to 2012. As for searching literature for European history you will no doubt gain information and insights at the portal European Historical Bibliographies maintained by the Berlin-Brandenburgische Akademie der Wissenschaften. A number of current historical bibliographies presented at this portal can be consulted online. For the history of the city and province of Utrecht you can use the online bibliography at SABINE which in a number of cases provides also links to digital versions of articles and books. When it comes to studying the history of witches and witchcraft I must confess to start at almost zero. It is years ago that I read a monographic study on witchcraft, and this particular study, Lène Dresen-Coenders, Het verbond van heks en duivel : een waandenkbeeld aan het begin van de moderne tijd als symptoom van een veranderende situatie van de vrouw en als middel tot hervorming der zeden [The pact of witch and devil: an Early Modern fallacy as a symptom of a changing situation for women and as a means to reform morals] (diss. Nijmegen; Baarn 1983) did not convince me at all. Perhaps I was simply wrong in choosing to read this book with its overlong title and its hypotheses which still seem to me farfetched. In fact I kept away from a whole group of Dutch historians doing maatschappijgeschiedenis, “history of society” who favored studies of minorities to detect changes in mentality. Any exclusive focus still makes me frown, but the history of mentalities and cultural history in general is of course fascinating and most valuable. If I was to start nowadays doing research on this theme I would look first at such fine guides as the section on Hexenforschung at the German history portal Historicum.net. Klaus Graf is the moderator of a useful mailing list on witchcraft research. You can also point to a succinct thematic bibliography provided in Dresden, the Dresdener Auswahlbibliographie zum Hexenforschung, which unfortunately has not been updated since 2004. In Tübingen the Arbeitskreis interdisziplinärer Hexenforschung sets an example of bringing several disciplines together. Unfortunately Jonathan Durrants’ online Witchcraft Bibliography was not available when writing this post. Older literature up to the end of the twentieth century can be found for example in a bibliography preserved at a website of the University of Texas. For Flanders Jos Monballyu (Kortrijk) has created a fine online bibliography and a selection of relevant sources concerning witch trials. He has written many studies about witches and traced many criminal sentences concerning them in Flemish archives. The Cornell University Witchcraft Collection is most useful with its bibliography and digital library. In American history the Salem Witch Trials (1692) offer a fascinating window on early American society. You can find many documents online, in particular at the Salem Witch Trials Documentary Archive and Transcription Project (University of Virginia), at Douglas Linder’s Famous Trials website and at a portal dedicated to the events in 1692 with a digital collection of books and archival records. The perceptions of behavior and the attempts at dealing with such behavior in courts of justice, not to forget the changing perceptions of justice, are among the elements which make the persecution of witches, witchcraft and sorcery interesting for legal historians. Of course these examples can be multiplied, but this would far exceed the boundaries of a blog post. Here I have sketched only the outlines of things worth exploring further. I called Oudewater a Dutch lieu de mémoire. In the book series Plaatsen van herinnering sofar five volumes have appeared since 2005 which follow for my country – albeit somewhat belated – the example of Pierre Nora’s seminal Les lieux de mémoire (3 vol., Paris 1984-1992). This interest in historical places and the ways events are remembered at particular places help us to remember history and legal history, too, happened to people in particular times and places, and not just somewhere as a part of a supposed or real historical process. Even a small building in a dreamlike preserved old town can relate to larger events. The scenic old streets of Oudewater was the scene of some very real events, but they are the background, too, for a very stubborn tradition of perceived history. The living memory and the construction or even invention of (parts of) history related to a particular place tell us the fascinating history of the uses of history, changes in perceptions and the construction of identity in time and space. One of the things that make me uneasy in writing about witchcraft is the sheer proliferation of literature on this subject. Many scientific disciplines occupy themselves with sorcery and witchcraft and its history. It is very easy to miss a whole range of interpretations stemming from a particular corner or country. The road of using bibliographies is long. Sometimes it seems attractive to take a shortcut which in the long run does not bring you much further. Legal history should pay due attention to colored perceptions and distortions of historical facts and events in order to keep an open eye for its own pitfalls, shortcomings and blind corners. This entry was posted in Buildings and tagged Bibliography, Criminal law, Cultural heritage, Legal history, Netherlands, Witchcraft on August 19, 2013 by rechtsgeschiedenis. In the early sixteenth century some changes become already visible in the way lawyers approached the law. Not only was there a growing interest in the history of Roman and canon law, but lawyers began to free themselves from the framework offered by these legal systems. One of the signs of this are the titles of legal treatises, the growth itself of this genre, and a more systematic approach of law. Nicolaus Everardi’s book on legal argumentation, his Topicorum seu de locis legalibus liber (Louvain 1516) is an example of this development. The book of this Dutch lawyer who presided the Court of Holland and the Great Council of Malines became almost a bestseller because of the reprints published everywhere in Europe. Printers in Bologna, Basel, Paris, Lyon, Strasbourg, Venice, Frankfurt am Main and Cologne printed this book until the mid-seventeenth century. I have found eight reprints of the first edition and eighteen of the second edition. On the blog of the Arbeitsgemeinschaft Frühe Neuzeit Klaus Graf recently criticized sharply the new database Early Modern Thought Online (EMTO) of the Fernuniversität Hagen that enables you to search for editions of texts in the broad field of early modern philosophy and thought. The EMTO database notes in the search results the availability of online versions. In this respect Graf saw major shortcomings, because EMTO does not harvest its results from some of the major sources for early modern texts online. During my searches in digital libraries I have often looked for a digitized copy of an edition of Nicolaus Everardi’s book on which I wrote my Ph.D. thesis. Against all expectations it was EMTO that finally brought me to a digitized edition of the Topicorum liber, often printed with the title Loci argumentorum legales. More in line with Klaus Graf’s review is the fact EMTO includes only one digitized edition from a library where in fact several editions of it have been digitized, including the editio princeps of 1516. Graf ends his short review with recommending a search strategy. The German Wikisource website has a page on the creation of bibliographies and the collection of bibliographical data which amounts to a guide for searching digitized books. The proof of the pudding of a search strategy or a database is its practical use and effectiveness, so let’s proceed to test it for Nicolaus Everardi (around 1492-1532). EMTO points to an edition of Everardi’s book made available by Google Books. However, a quick look at the book shows a shelf number and a book mark of the Bayerische Staatsbibliothek in Munich. Google Books indicates more editions have been digitized, and it is strange EMTO does not include this information. Until recently the Digitale Sammlungen formed the only gateway to the books and manuscripts digitized at Munich. These rich collections contain digitized works of Everardi’s name sake, Nicolaus Everardi of Ingolstadt (1495-1570). The new OPACPlus offers more search possibilities than the Digitale Sammlungen. It appears not only editions of the Topicorum liber have been digitized but also his Consilia (Arnhem 1642, a late edition) and even four editions of the Synopsis locorum legalium, a reworking by Georg Adam Brunner (Magdeburg, around 1555, Darmstadt 1610, Ingolstadt 1643 and Regensburg 1671). The Bayerische Staatsbibliothek has digitized the editio princeps of 1516, the reprints Bologna 1528, Paris 1543 and Basel 1544. A second augmented edition appeared for the first time in Louvain in 1552, posthumously edited by sons of Everardi, and the reprints Lyon 1564, Venice 1567, Lyon 1579, Frankfurt 1581, 1591, 1604 and 1620, Cologne 1662. Thirteen digitized versions is more than I could have imagined! Which books by Nicolaus Everardi do you find following the bibliographical strategy recommended by Klaus Graf? I will use also Graf’s general Leitfaden, his compact guide at the NetbibWiki. The Karlsruher Virtueller Katalog (KVK) is the first major tool to use. This meta-catalogue searches in library catalogues and collecitve catalogues worldwide and increasingly indicates digitized books. To show its range and depth I will take the example of the edition Paris 1543, the only result given by EMTO. When working on my thesis I had only found copies of this reprint in Munich, one at the Bayerische Staatsbibliothek, the other one at the other side of the Ludwigstrasse in the university library of the Ludwig-Maximilians-Universität München. The KVK shows copies of the 1543 reprint in Rostock, Halle, Dresden and Washington, D.C. in the Library of Congress. Somewhat surprising remains its absence in French collections. The German Wikisource has a fine list of digital collections. Searching in them will take more time, but is the obvious thing to do. To this German list I would add for completeness’ sake in the field of wiki’s the list of digital library projects on the English Wikipedia. Let’s continue with the search tips of the Wikisource list. OAIster is since a few years integrated with WorldCat, an initiative to search in library catalogues worldwide. After having seen the results found by the KVK OAIster’s harvest is very minimal, just one book written by the Ingolstadt namesake of Nicolaus Everardi, and not surprisingly digitized at Munich. OAIster’s slogan “Finding the pearls” sounds a bit hollow to me. At this moment six of his works have been digitized. The Bielefeld Academic Search Engine BASE does find only these six works at Munich, because only the documents in the Digitale Sammlungen are among the repositories harvested by BASE. Using the Europeana library portal brings you to twenty results. Only one Munich copy of an edition of the Synopsis by Brunner is noted here, the six works of the Ingolstadt Everardi are present, and nine results from Munich specifically for my Everardi. The university library at Ghent has digitized the reprint Lyon 1579, and the Göttinger Digitalisierungszentrum the reprint Frankfurt 1604. Europeana finally shows bibliographical information for the reprint Bologna 1528, Venice 1539 and 1567 with images of the title pages made available for the census of Italian imprints of the sixteenth century. The Wikisource list continues with a number of German tools. The BAM portal, a portal to German libraries, archives and museums, mentions almost 200 search results for Everardi, fourteen of them for Nicolaus Everardi, three for the Ingolstadt law professor and one for a Memoriale juridicum created by Georg Bucksulber from Everardi’s work. BAM finds the Consilia of the Ingolstadt Everardi (2 vol., Frankfurt 1603-1604), but not one digitized book for this test case. The list mentions ZEVEP which searchs in repositories and publishers’ catalogues, and the OPUS site at Stuttgart mainly presenting modern materials in digital repositories of German universities, with nothing for my example. EROMM, the European Register of Microforms and Digital Masters, does bring just one result for my case. The Zentrales Verzeichnis Digitalisierter Drucke seems promising. It yields all digitized books in Munich of my example, but it succeeds in presenting as separate objects the parts of the alphabetical index in the edition Frankfurt 1604 held at Göttingen. I will not tediously list all German catalogues. One of the more interesting is the Okeanos server of the library centre for Nordrhein-Westfalen and Rheinland-Pfalz. This centre has also created Digibib which enables you to choose libraries anywhere in Germany, to use it as a meta-catalogue for all Germany, or to use links in its generous link selections. The HEBIS portal from Hessen is leaner than Digibib but brings less search results for my case. Intriguing and frustrating is the link to a digitized manuscript of Nicolaus Everardi Ingolstadtiensis at Stuttgart, Württembergische Landesbibliothek, HB VI 15, a persistent link unfortunately not – or not yet – correctly resolved. Searching directly at the website of the Stuttgart library did not bring me to this manuscript. The overview at the German Wikisource has not forgotten other countries. In passing the TROVE website of the National Library of Australia is noted. The clear presentation of the different types of search results make it certainly look like a kind of treasure trove, but it brought me for this very specific case only a few useful results. The Pionier portal to Polish digital libraries is in principle the kind of tool which should bring results covering many or all digital libraries in one country, but alas without results for my Dutchman. Wikisource continues with a brief section on digitized manuscripts, scientific journals and newspapers. The low rate of digitization in Switzerland is lamented, but to E-rara one can at least add retro-seals for digitized journals, the mainly Francophone RERO DOC digital library of the West Swiss library association, and for manuscripts e-codices. Dana Sutton’s Philological Museum deserves well-earned praise for his efforts to create an analytical bibliography and to locate copies of digitized books with texts in Neo-Latin written after 1500. As for now only the Ingolstadt Everardi is to be found here. Elsewhere Graf almost groans about finding out about the holdings of digital libraries in Japan, but here progress is surely possible as shown at the “DigiMisc” page of the NetbibWiki. Perhaps the Everardi case is too much a case of a rare book, a rather paradoxical conclusion for a book reprinted so often during 150 years and even having its own offspring in the form of a Synopsis and a Memoriale, but some conclusions seem clear. Using the major collective catalogues and meta-catalogues is indeed the best point of depart. The KVK and its sisters for theology and religious history, the Virtueller Fachbibliothek Theologie und Kirche and the Kirchlicher Verbundkatalog, combined with Digibib and the BAM portal, give Germany a very dense coverage. Given the fact that Europeana exists only a few year it is no wonder its results can sometimes seem meagre. Wikisource did not mention the European Library, the consortium of Europe’s national libraries. The Wikisource page does offer a useful general approach to digitized books, and not just a handy list for checking bibliographical data. The NetbibWiki, an initiative of Klaus Graf, offers far more detailed pages on many aspects of libraries and digital collections, for example for incunabula. It helped me very much creating my own page on digital libraries with a focus on law and legal history. To me the best practice seems to start using the major meta-catalogues, such as the KVK, Melvyl (California), the Belgian LIBIS network, URBS and maybe the Vatican Library as a class of its own, then to go to the large digital libraries and specific national digitization projects, and finally to use the collections assembled for the field of legal history, history and law. This is a world awaiting to be conquered, and surely searching digitized materials will still consume time. However, taking into account this triple approach means also you are following the path set out by Everardi who discussed among his forms of legal argumentation a enumeratione partium, “from counting the parts”. Klaus Graf points at his blog Archivalia to a list of French digital libraries at Bibliopedia. Karen Reeds points to the Internet Archive, only briefly mentioned in the list on Wikisource. It contains a growing number of books from American and Canadian libraries, and the search possibilities of the Internet Archive deserve close attention. For old juridical books it is never too late to check the holdings of the Max-Planck-Institut für europäische Rechtsgeschichte in Frankfurt am Main and this institute’s catalogues of old editions created by Douglas Osler. National bibliographies, bibliographies of legal books – e.g. the Bibliography of Early American Law by Morris L. Cohen (6 vol., Buffalo, N.Y., 1998; supplement 2003) – and special bibliographies for old editions, some of them online such as the Short Title Catalogue Netherlands, the Short Title Catalogus Vlaanderen for Flanders, the German VD16, VD17 and VD 18 (with digitized copies), the English Short Title Catalogue, the Italian EDIT16 and the Catálogo Colectivo de Patrimonio Bibliográfico Español, should not be forgotten. Book History Online is a database of the Dutch Royal Library in which you can search for bibliographical literature. This entry was posted in Digital editions and tagged Bibliography, Digital libraries, Early printed books, Great Council of Malines, Legal history, Medieval law, Netherlands, Rare books on February 5, 2011 by rechtsgeschiedenis. What makes a book rare? No doubt in 2011 rare books will show up in this blog. But what makes a book rare? I had no idea I would write about rare books in my first posting this year, and perhaps this fact helps to understand the word rare better. Instead of rare, meaning only seldom seen, known to be present at only a few locations, rare often has the added quality of being unlooked for. The departments of research libraries for Rare Books and Special Collections often combine this approach of bringing together manuscripts and books that have survived the centuries, editions of texts once common but now only found after extended research, and books and items brought into the possession of a scientific institution in a remarkable way. A scholar left his book collection, his research notes, lectures or papers to a university library, or a librarian succeeds at an auction in buying books on a particular theme. Sometimes a particular book was already a rarity at the time it left the press because of its contested contents or of its beautiful layout. It could have been printed on expensive paper or even parchment, and a priceless luxury binding increased its value, too. You might have guessed that I somehow could not help spotting old books today, completely against the planning for new postings. I surfed to Belgica, the digital library of the Royal Library in Brussels. As an example of valuable editions now digitized the Royal Library presents in its showcase a volume with 43 juridical dissertations defended between 1652 and 1655 at the University of Franeker under the aegis of Johann Jacob Wissenbach (1607-1665). The accompanying note states these dissertations are not included in the Short Title Catalogue Netherlands (STCN). The STCN aims at presenting data on Dutch imprints between 1540 and 1800 present in a generous selection of major Dutch libraries. Which facts would enforce the conviction that these old juridical dissertations once defended at a university in Frisia are indeed rare and worth digitizing? The volume came originally from the library of the dukes of Arenberg and was confiscated after the First World War. This story accounts at least for the unexpected way this volume came into the possession of the Belgian Royal Library, but surely more can be done to estimate its rarity. One of the major projects for digitizing old dissertations is housed at the Max-Planck-Institut für europäische Rechtsgeschichte at Frankfurt am Main. To its holdings belong more than 70,000 juridical dissertations defended at universities within the borders of the former Holy Roman Empire. At Frankfurt 31 dissertations from Franeker have been digitized, and the dissertations at Brussels are not among them. This fact can rightfully form an indication that the 43 mid seventeenth-century dissertations are rare indeed. I will not make this post any longer than necessary, and therefore I will just indicate which further steps need to be taken to ascertain more about the rarity of this volume. One step is to look at the holdings of libraries worldwide for particular dissertations within this set. Modern meta-catalogues are truly catalogi omnium catalogorum, foremost among them the Karlsruher Virtueller Katalog. The KVK enables you to search in many catalogues – including collective catalogues – at the same time with just one search action; text search is one of the latest additions to the KVK. Neither the KVK nor a few other major collective catalogues mention these particular dissertations. The other way to tackle this question is the road of bibliographies. Ferenc Postma and Jacob van Sluis published for the Frysk Akademie a bibliography of publications from Franeker, Auditorium Academiae Franekerensis. Bibliographie der Reden, Disputationen und Gelegenheitsdruckwerke der Universität und des Athenäums in Franeker 1585 – 1843 (Leeuwarden 1995). Postma and Van Sluis did every effort to find disputations from Franeker wherever held. In my opinion one can state safely whether an old edition from Franeker is rare or not by referring to their bibliography. Tracking juridical dissertations and establishing their authorship is something for specialists indeed. On publications by lawyers from Franeker it is also useful to look at the Bibliografie van hoogleraren in de rechten aan de Franeker universiteit tot 1811 by Robert Feenstra, Theo Veen and Margreet Ahsmann (Amsterdam 2003). Tresoar at Leeuwarden is the institution which combines the forces of the Frysk Riksarchyf and the Provincial Library of Frisia. For curiosity’s sake and because of the rich holdings housed at the former Treasury I checked for Johann Jakob Wissenbach in its catalogue. For Douvo Mellinga who held a disputation in 1654 contained in the set at Brussels a small volume survives with laudatory words by Wissenbach; to guess from the abbreviated title poems are concerned. To round off for today, some books are certainly unlooked for! You will not expect Frisian books at Brussels. However, take for a random example a digitized book on Danish litterature at Tresoar in Leeuwarden, the edition Hafniae (Copenhagen) 1651 of [Runir] seu Danica literatura antiquissima by Ole Worm, is less surprising in view of the relatively small distance between Frisia and Denmark. I look forward to find more at the Belgica collection at Brussels, even if I have to inform you that the search function for this digital library does not work as expected. Using the normal catalogue and being alert for URL’s in the search results brings you to the digitized items, not just books, but also maps, music scores, drawings, engravings and medals. In this post I did not give a clear and succinct answer to the question whether the Brussels volume is rare indeed, but I can now safely vouch for its rarity. Checking for Douvo Mellinga in the Karlsruher Virtueller Katalog led me to the Gemeinsamer Verbund Katalog which shows at the Universitätsbibliothek Hamburg a volume with two sets of disputations from Franeker, 43 in the first and 59 in the second, all presided by Johann Jakob Wissenbach, printed by Arcerius (Franeker 1658). In this volume the first disputation by Bartholomaeus Franck seems to be identical with the first disputation in the Brussels convoluted set, and the eleventh disputation in both sets is by Douvo Mellinga. It seems the Hamburg online catalogue shows old or incomplete bibliographical data, or more probable, one assumed the publisher of the second set to be also the publisher of the earlier “first” set. Cataloguing old juridical dissertations is a task for experts, and I do not want to offend any librarian. Ferenc Postma send me a comment stating he and Jacob van Sluis have found some 500 “new” titles for a supplement to their bibliography. This entry was posted in General and tagged Belgium, Bibliography, Denmark, Digital libraries, Early printed books, Franeker, Frisia, Legal history, Rare books on January 3, 2011 by rechtsgeschiedenis. This year I have spent quite some time searching the internet both for information for my postings and for the pages of my website www.rechtshistorie.nl. At some turns I felt the clear temptation to use the main gateways to online information. In particular when dealing with digital libraries the presence of WorldCat, the Open Library and the World Digital Library seemed an invitation to refer people for once and forever to these endeavours which aim so much wider and higher than my efforts. However, when I tried to use these websites most times I returned empty-handed. With only 1350 items the World Digital Library still has many empty shelves, even if one has to applaud the fact that all continents and major regions of the world are represented. Many months ago a notice by archivist Eric Hennekam on his Dutch archive forum made me smile about such heroic efforts. It makes one aware of the many obstacles faced by the pioneers behind these projects with a claim to completeness or worldwide coverage, and of the fact that the 21st century is not the first century to witness similar proposals. Through the centuries lawyers, too, have left their footprints on this trail. Hennekam pointed to the history of the Mundaneum at Mons, about which institution The New Yorker had published in June 2008 an article by Alex Wright, “The Web Time Forgot“. The Internet Archive has stored the documentary All Knowledge of the World (Alle kennis van de wereld) by the Dutch VPRO television from 1998 about the creator of the Mundaneum, Paul Otlet (1868-1944). Wright tells the story with more skill than I have at my disposal, so I will only give a summary. Otlet was a Belgian bibliographer who created the Universal Decimal Classification. He worked together with the Belgian politician and pacifist Henri la Fontaine (1854-1943) who won the Nobel Prize for Peace in 1913 for his Bureau International de la Paix. La Fontaine teached international law at the Université Libre at Bruxelles. In 1895 Otlet and La Fontaine founded the “Institut International de Bibliographie”. Otlet did not only devise a new classification system, but used it at his institute and envisaged powering it with a mechanical system to link information. Many million library records survive and eventually the project became too vast. In 1934 Otlet published his major bibliographical work, the Traité de documentation presenting his vision of reading library books at home using a kind of telescope. The card collection was housed at several addresses before the remains – some six kilometers of files – arrived at Mons after the Second World War. Today the Mundaneum offers shelter to archives on feminism, pacifism and anarchism. Were Otlet and Fontaine the first people to create such projects? The nickname of an early multivolume collection of juridical treatises, the series called Primum [-Decimum] volumen tractatuum doctorum iuris published in Lyon in 1535 was “Oceanus iuris”, “The Ocean of Law”. At Jena the Thüringer Universitäts- und Landesbiblothek has created a digital edition of this edition in ten volumes from its “Historische Bestände“. The Bibliotheca Universalis (1545) of Konrad Gessner – online at the Universitat de Valencia – can claim to be the first early modern attempt at universal bibliography. More early editions books of works by this Swiss scholar have been digitized for E-Rara. The Lyon 1549 edition of the Tractatus Universi Iuris counts seventeen volumes, and the better known version printed between 1584 and 1586 at Venice has 27 volumes with four volumes for the indices. Gaetano Colli has used his book about this edition of the Tractatus Universi Iuris to create an online database to assist the search for treatises by particular authors or on special subjects in this collection. The copy at Harvard Law School of the Venice edition of the Tractatus universi iuris has been digitized. Other early lawyers tried to create comprehensive surveys of all fields of law. Giovanni Nevizzano published a Index librorum omnium qui in vtroque iure hinc inde eduntur (Venice 1525; online in Vienna at the Österreichische Nationalbibliothek), a generation later superseded by Giovanni Baptista Ziletti and his Index librorum omnium nomina complectens, in utroque iure tam pontificio quam caesareo (Venice 1559), better known as the Index librorum omnium iuris tam pontificii quam caesarei (Venice 1566), an edition digitized at the Göttingen Digitalisierungszentrum. Among their successors are for instance Agostino Fontana with his Amphitheatrum legale (4 volumes, Parma 1688-1694; reprint Turin 1961; online at the University of Michigan, Hathi Trust Digital Library) and Martinus Lipenius with the Bibliotheca realis iuridica first published in 1679. The Leipzig 1757 edition – online at Polib, the digital library of the universities of Lille – has been reprinted in 1970. The 1775 and 1789 supplements are online at the Hathi Trust Digital Library, and now also the edition 1679. It should not surprise you that I have not yet found a digital version of all works mentioned here. Please do not hesitate to share your knowledge if you know more! A most remarkable digitization project is to be found at the Biblioteca Marucelliana in Florence for the multi volume manuscript called Mare Magnum, a universal bibliography created at the beginning of the eighteenth century by Francesco Marucelli. This manuscript was never printed, but can now be consulted online. In the last century John Gilissen and a team of legal historians working with him edited a bibliographical project with a less ambitious title, Introduction bibliographique à l’histoire du droit et à l’ethnologie juridique (6 vol. in 8 parts, Bruxelles 1963-1988). I would like to finish this posting by bringing you to a digital library at the Université de Poitiers called Les premiers socialismes, a new project with both modern studies on the first French socialists such as Fourier and Saint-Simon and works by them. Socialist utopism was an important current in the nineteenth century. The links selection on this site could bring you to the Familistère de Guise, a housing and factory project near St. Quentin, on its website characterized as a realized utopia. Clearly some people will keep trying to realize utopian projects. Modern technology certainly offers some of the means to create also virtual utopias. The internet realizes to a large extent even more than visionaries like Jules Verne could dream of or describe. These days it is clear that bringing digital information on an unprecedented worldwide scale is not just the dream of scholars or journalists, but a major fact in private lives and public life. Politics and law are touched by it and try to influence it. A legal history of Internet is not a fancy book title anymore. On March 17, 2011, Mike Widener, curator of the Rare Book Room of the Lilian Goldman Law Library of Yale University, wrote a blog post showing the frontispiece of the Jena 1743 edition of Burkhard Gotthelf von Struve’s Bibliotheca iuris selecta, another legal bibliography. Of Struve’s work several reprints and enlarged editions exist. Many works by Struve have been digitized in Halle, Dresden and Munich. Using the OPAC Plus catalogue at Munich you can now find seven (!) digitized editions of Struve’s Bibliotheca iuris selecta, Jena 1703, 1710, 1714, 1720, 1725, 1743 and finally the 1756 edition. The Jena 1725 edition has also been digitized now at Dresden. Nevizzano’s work was first published with the title Inventarium librorum in utroque iure hactenus impressorum (Venetiis 1522). The 1525 edition was prepared by Luis Gomez. Both editions are very rare. In 2016 Nathan Dorn wrote a post about Nevizzano’s books at In Custodia Legis, ‘List Makers and the Law in Renaissance Europe’. He noted also an edition of Nevizzano’s work edited by Johann Fichard (Basel 1539). In 2015 the Mundaneum digitized the books of Paul Otlet, but it had already been digitized at a private website about Otlet. Part of the archival records can be viewed online in its digital archives, part of the Google Cultural Institute. In fact there are now eight virtual exhibits. The Mundaneum partnered with this firm also for a virtual exhibition À la génèse de la société de l’information (also available in English and Dutch). The Mundaneum has a website which you can view in French, Dutch, or English. You can read Otlet’s Traité de documentation (1934) on the French Wikisource portal. The institute is active on social media, and in 2015 an app has been launched. Children can enjoy the tablet game Mundaneum-Web 1895. This entry was posted in General, Scholars and tagged Belgium, Bibliography, Books, Digital libraries, Legal history on December 10, 2010 by rechtsgeschiedenis.